Little did Edward ‘Chicken’ Hartopp know, when he organised the first polo game in England in 1869 between his regiment the 10th Hussars and the 9th Lancers, just how popular British polo was to become! The world’s first match, however, was between the Turkomans and the Persians in 600BC and since then it has remained popular through history, early on in India and Japan and later in Argentina and the Americas. Polo fields are usually constructed from existing fields hence are soil-based which is a benefit, in terms of nutritional retention, when compared to the modern sand-based football pitches. 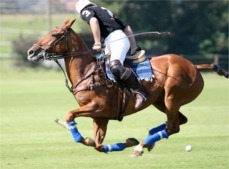 The forces exerted on the sward by a polo pony are clearly far-greater than those of a footballer (!) and must be taken into consideration when selecting grass species and soil rootzone material. The playing surface needs to be firm without being so hard that the ponies’ joints are stressed. The surface damage during a match is extensive and must repair fast between matches. As with all grass ‘pitches’, presentation is vitally important so leaf coverage and colour are crucial and expected. Grass diseases are no strangers to polo fields and the historical use of the field will play a part. For example a field that was cropped for cereals will have a history of chemical and fertiliser abuse and the same goes for extensive dairy. Nutrient availability will be seriously compromised and will need to be addressed if the grass plants can be expected to achieve their genetic potential and naturally resist infection. Fairy rings on one club’s field were bisected by the boards. The Field Science tailored dressings were applied but only on the actual playing surface and on the next visit it was noted that the rings were only evident outside the boards! Needless to say the whole field is now treated. The Field Science System involves a technical visit to identify issues with the playing surface, learn the field’s history and take soil samples for detailed analysis. Once the samples are analysed by a third-party laboratory a full report is sent to the polo club including a quotation for a tailor-made trace element and mineral dressing. This dressing is designed to last for 6 – 8 weeks from application and can incorporate tailored fertiliser thus reducing unnecessary travelling on the playing surface. The process is repeated to ensure that the dressings are applied every 6 – 8 weeks and that each dressing is tailored to fit. The Field Science dressings will ensure that all salient nutrients are available to the grass plants as and when required, through the soil as nature intended and we would expect to see improvements in leaf resilience, sward density, speed of repair, drainage, leaf colour and resistance to disease.